A mainly nearctic genus, with many cryptic and potentially hybridizing species. 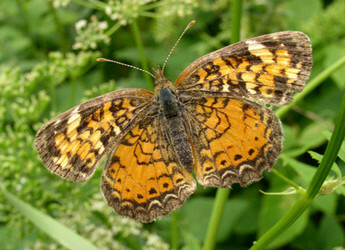 Specimens identified as Phyciodes batesii, P. pulchella, P. cocyta and P. tharos are not distinguishable from one another on the basis of the DNA sequences employed by Wahlberg et al. 2003 or Wahlberg and Freitas 2007. Wahlberg N, Oliveira R, and Scott JA. 2003. 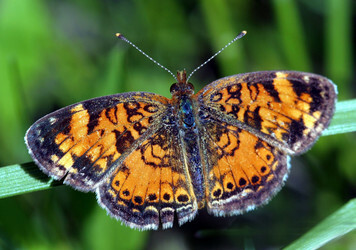 Phylogenetic relationships of Phyciodes butterfly species (Lepidoptera: Nymphalidae): complex mtDNA variation and species delimitations. Syst. Ent. 28: 1-17. Page: Tree of Life Phyciodes Hübner 1819. Authored by Andrew V. Z. Brower. The TEXT of this page is licensed under the Creative Commons Attribution License - Version 3.0. Note that images and other media featured on this page are each governed by their own license, and they may or may not be available for reuse. Click on an image or a media link to access the media data window, which provides the relevant licensing information. For the general terms and conditions of ToL material reuse and redistribution, please see the Tree of Life Copyright Policies.